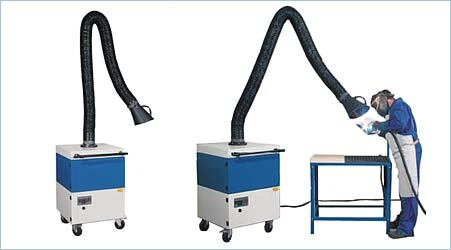 This mobile welding fumes filter is BGIA-certified for all TEKA suction arms (0 150 mm). Separation efficiency is = 99 %. The unit corresponds to the security requirements for units of the welding fume category W3 (high-alloyed steels). When handling the unit correctly, you can use it for circulating air operation because it fulfils the requirements for the exceptional rules according to the new hazardous substances ordinance. A stable construction made of steel plate with continuous powder coating guarantees a low maintenance even under rough conditions. The gross particles are separated in the pre-filter. Afterwards the air is guided through the particle filter where even finest fumes and dusts are separated. The lifting device guarantees an absolute impermeability and therefore the separation efficiency of the filter unit. The air is evacuated on the backside of the unit through an outlet grill and rises up. Thus, at a distance of 1 m you cannot perceive a disturbing air flow any more. The unit is fitted with a high-capacity fan with high negative pressure which guarantees a high volumetric flow even if the filter is saturated. A SIMPLE but Highly efficient three pack N.D.T System, Suitable for checking welds and Stressed machine parts for cracks and flaws, before and aftre welding or machining. Pre-clean inspection area with CLEANER SC-30TM to remove oil, grease or with wire brush to remove Scale, rust for easier penetration. 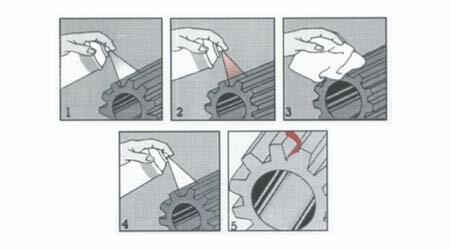 Spray or brush with PENETRANT SC-10TM Allow penetration time as per table below. Shake the Aerosol can vigorously or stir the bulk developer. 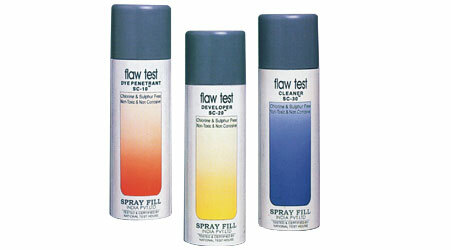 Spray DEVELOPER SC-20TM in thin, uniform film, from a distance of 8 to 12 inches and 6-8 short sections at a time. Allow to dry. Area coverage 25 Sq mts/ lit. appox. The Dye-penetrant method of in spection with flaw test System may be used on materials Such as Aluminium, Magnesium, Barss, Copper, Cast Iron, Steel, Stainless Steel, Ceramic & Certain Plastics. Root weld & Fill in one Pass. 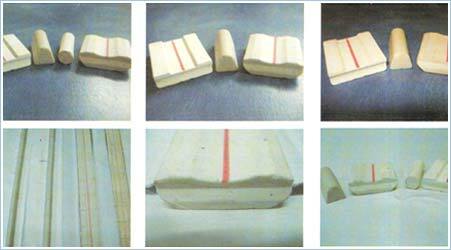 Hitech Sintered ceramics - Profiles. Special sizes & Profile available. Especially packaged & sealed in plastic for moisture protection. Wider heat receptive pressure sensitive foil for extra improved adhesion to work piece. Special high receptive foils are also available on request. For perfect ignition & arc stability, the electron work function needs to be as low as possible. This is guaranteed by the oxide doping of tungsten. A decisive factor for the characteristics of an electrode is the volume percentage of oxide additives. In thorium free qualities this content is higher than in a conventional Wt20 electrode. The more homogeneous & fine distributed the oxides are in the structure, the better are the effects on arc stability, ignition, burn-off behavior and service life. The thorium free qualities Wc20 & GOLD plus are characterized by a considerably more homogeneous and finer distribution of oxides. Crack-free electrodes as well as a constant electrode tip geometry are required for low burn-off & therefore long service life. 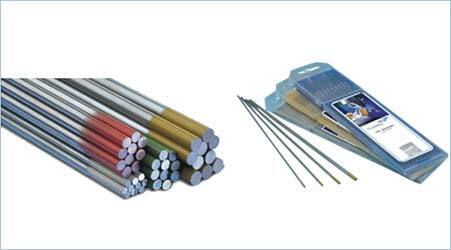 Due to perfect precision in the forming process, PLANSEE supplies high quality electrodes without any distribution of oxides. The substitute materials cerium & lanthanum have proofed themselves as non-radioactives substitutes for thorium oxide. Both materials have an especially low electron work function, which is even lower than that of thorium oxide. Our thorium free TIG-welding electrodes (W, Wc20, GOLD plus) meet requirements concerning ecological & health related aspects. Cal - Guard Anti Spatter is a water based, paintable, cost effective and non-inflammable agent for the prevention of weld - spatter adhering to metal surfaces during the welding process. Cal - Guard Anti-Spatter Spray has outstanding performance preventing spatter sticking to a wide range of steels, including mild steel, stainless steel and aluminium. Cal - Guard Anti Spatter Spray avoids the need for mechanical abrasion or grinding of weld spatter following welding. 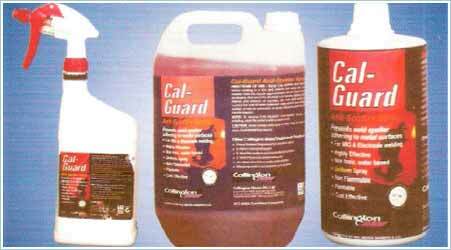 Cal - Guard anti spatter is available in 1 litre, 5 litre drums, 500 ml trigger spray packs available on request. Appearance : Light red mixes freely with water. 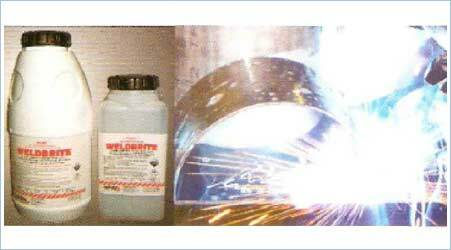 Welbrite utilises innovative Australian Technology for the formulation of a high adhesion stainless steel pickling gel. It is used to remove the black oxide marks or burn scale left during welding of stainless steel. After use of Welbrite the weld area should have the same look as the rest of the steel being used. Welbrite leaves a clean professionally finished stainless steel weld area. Is a strong AST A 380 complaint formulation. A thick high adhesion gel. Provides fast ating, one step descaling. Enhancement of the auto passivation process Efficiency in fabrication. Easy to use, even on vertical surfaces.